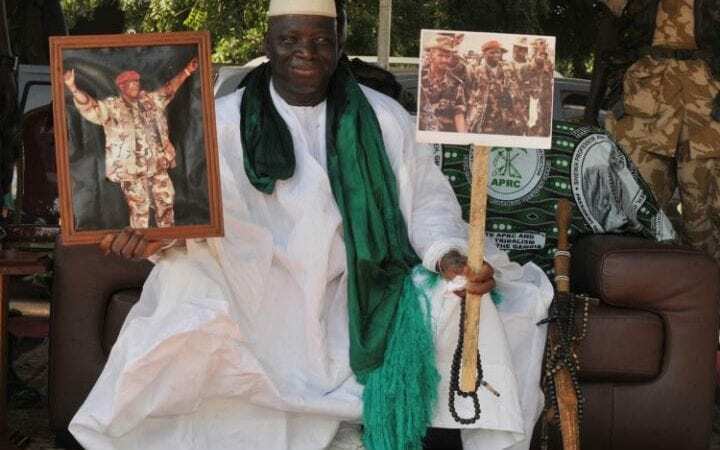 During his 22-year reign of terror in Gambia, he grandiosely referred to himself as “Excellency Sheikh Professor Doctor President”. Now, three months after being deposed, Gambian despot Yahya Jammeh is seeking a rather more modest title – humble farmer. The former president, who is accused of decades of human rights abuses, fled to Equatorial Guinea in January after being offered asylum by fellow dictator Teodoro Obiang. Since then, nothing has been heard from him – but photos have now emerged showing him starting a new life in agriculture. 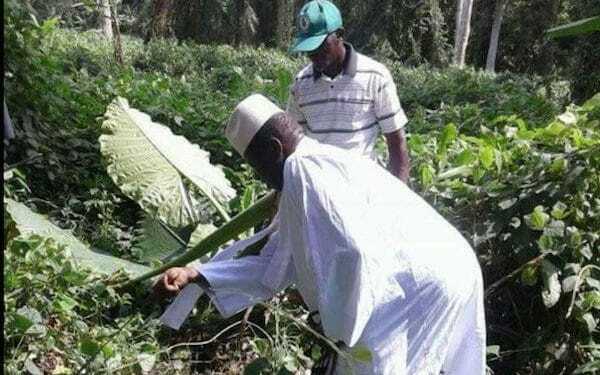 In the pictures – thought to have been released by Mr Jammeh himself – he and Mr Obiang are seen inspecting a plot of land together and helping workers clear areas of bush. “It’s one of the best patches of farmland in Equatorial Guinea, and we hear President Obiang has given Mr Jammeh a chunk of it,” said Tutu Alicante, director of EG Justice, a US-based human rights group. The sight of Mr Jammeh re-inventing himself as a simple man of the soil has caused much comment among fellow Gambians, who remember his extravagant tastes and fleet of luxury cars. But judging by reactions on Gambian social media, the response has been scepticism rather than sympathy. Many noted, for example, that Mr Jammeh was still sporting the same spotless white robes he wore in office – hardly practical for labouring on a muddy farm in the rainforest. Other observers are intrigued by the once-portly president’s apparently remarkable weight loss. While many wondered whether he had gone on a diet, diplomats told The Telegraph it was because he no longer had to wear a bulky bulletproof vest under his robes. Mr Jammeh’s downfall began in December, when he suffered a surprise election defeat to Adama Barrow, a Gambian property developer who once worked as a security guard for an Argos store in London. Mr Jammeh then reneged on a promise to step down, claiming the vote had been rigged against him. He finally bowed out a month later, after fellow West African leaders threatened to send in troops to remove him. As one of the conditions for agreeing to go quietly, he was offered sanctuary in Equatorial Guinea, where President Obiang has been in power since 1979, making him the world’s longest-serving political leader. In 2004, he was the target of the failed 2004 “Wonga Coup” for which the Eton-educated British mercenary Simon Mann, ended up sentenced to 35 years in Equatorial Guinea’s notorious Black Beach prison. Despite their shared reputation as old-school African strongmen, Mr Obiang and Mr Jammeh were not known for previously being close. However, Mr Obiang appears to have thought that taking Mr Jammeh in would build his reputation as as a regional powerbroker. “It is very hot and sticky in Equatorial Guinea, but I am sure Mr Jammeh will be well looked after,” Mr Mann, who was pardoned by Mr Obiang in 2009, told The Telegraph. Mr Jammeh is believed to be living in one of several grace-and-favour palaces built by Mr Obiang in his home town of Mongomo, which also boasts an international airport, a football stadium that hosted matches for the 2015 Africa cup, and an international standard 18-hole “Presidential Golf Course”. Nearby is the newly-built city of Oyala, carved out of virgin rainforest as a secure alternative capital to the existing one, Malabo. President Obiang moved the entire government there in February, having declared that being in Malabo, which is on an island, left him vulnerable to further coup attempts. 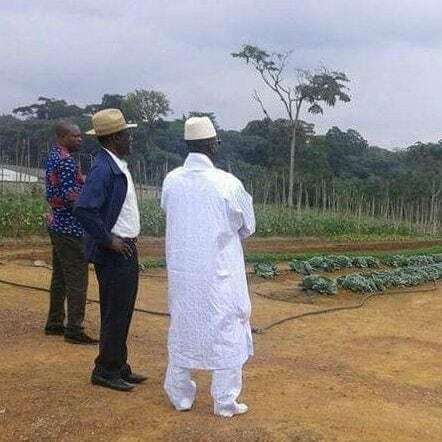 Beyond the pictures of him farming, nothing has been seen of Mr Jammeh. “The palace is surrounded by a ten mile-long wall and heavily-guarded so it’s impossible to know what he’s up to,” said Mr Alicante. Although Equatorial Guinea is not a signatory to the statues of the International Criminal Court, human rights groups hope that Mr Jammeh may still yet be extradited to face trial for the killing and torture of political opponents. There seems little chance of that in the short term, but a time may come when the ageing Mr Obiang, who is now 74, either steps down or passes away, and a new leader could see Mr Jammeh as a potential bargaining chip to rebuild Equatorial Guinea’s own tarnished reputation. As Mr Jammeh’s new farming career gets under way, he may be pondering that he may one day reap what he has sown.